As I mentioned in Part 2, by using facebook personally, you make getting the first batch of "Likes" for your business page 10 times easier. Simply add your friends and family members as friends to your personal account and send them a message through facebook requesting them to help you out. I would be willing bet that 100% of them will be happy to like your business page. Remember, in Part 1 of this series we said that on average, a facebook user has 130 friends. Hopefully your friends and relatives have that many or more. If they do, hopefully one or 2 of their friends will see that they liked your business page and follow suit. Rolodex? This is 2011. Open your email client and send out an email to your peers, prospects, and clients (Please BCC everyone so they don't hate you for sharing their email address with everyone!). Let them know what the benefits are to "Liking" you on facebook, and ask them to "Like" your page. This is also a good time to ask them to send you a link to their business page. It could be a great way to keep up with your business customers and see where your product or service offering fits in. What do almost all of the people that see your ads or website have in common? They all recognize the Facebook logo! Use it like it's your own! Users are already there, so they may as well be interacting with your brand. Want to make it even more worth their while to find you on facebook? Do a special ONLY for people that Like your business on facebook. Use Our Facebook Sign Generator! We have put together an easy way to generate a sign/badge for getting people to "Like" your business on facebook. You really should have a "vanity URL" first. If you are unfamiliar with facebook vanity URLs, it's simply the text that comes after http://www.facebook.com. 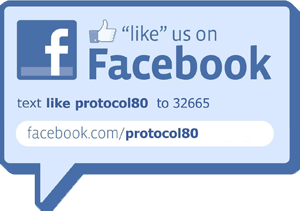 So, protocol 80's facebook vanity URL is 'protocol80' = http://www.facebook.com/protocol80 . Currently, you have to have 25 Likes to lock in a vanity URL. With the options above for getting Likes, that shouldn't be too hard. You may want a smaller facebook badge for some marketing materials. That's understandable. A quick google images search for Facebook Icon will yield many options. On Thursday, I'll post Part 4 in this series. I plan on discussing some of the advanced elements of a facebook page, such as custom Tabs. Be sure to check back!